When it appeared on iPhone, atebits Tweetie made desktop-based Twitter clients seem comparatively antiquated. Tweetie's features and clean UI made us hope it would be the first app to move from iPhone to the desktop. 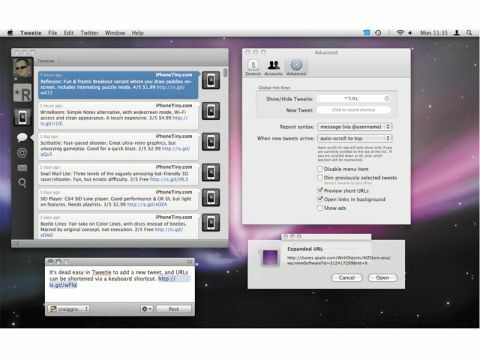 April saw our wish come true when Tweetie 1.1.1 for Mac appeared. Even though it was different from the iPhone release, it retained the same sense of design, style and usability. Although Tweetie's interface is distinctive, it's very usable. Rather than splattering words everywhere, icons rule. The sidebar provides a means of dealing with multiple accounts without using tabs – a quick stab on an icon focuses an account and provides access to its timeline, replies, direct messages and searches. For the keyboard-obsessed, most actions can be driven by a shortcut. Tweetie is also hugely configurable. You choose your URL shortening and image services, repost syntax, and global hot-keys for showing and hiding Tweetie. This version also makes the best better, adding saved searches, per-account notification preferences, Growl support, and bug fixes and tweaks. If that all wasn't enough, Tweetie doesn't have to cost a penny. If you don't fancy paying the shareware fee (although we say you should, because Tweetie's so good), you can use it for free. And even the adverts trump those in Tweetie's contemporaries, by virtue of being surprisingly relevant and non-intrusive.